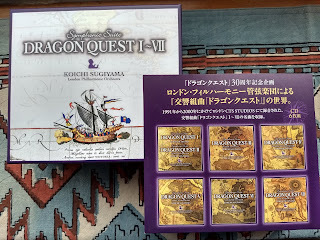 So now that I had acquired the more elusive We Love Wizardry, I was looking forward to getting hold of the Dragon Quest LPs from the 80s. These comprise I-IV, are orchestrated but also include the famicom chiptunes. While browsing around, and adding up what it would cost me to get good copies, I came across a compilation CD purple box set on Amazon's Japan store which made me scuttle my original project. For less money, I could get all the orchestrated versions from I to VII in new condition and pristine sound if I could let go of the original chiptunes and the Akira Toriyama artwork which aren't included on the CDs. Since, in the end, I cared more for the music itself I bought the box set and I'm perfectly happy. There was a rival black box set that included up to IX which was of even more limited issue. I decided against it for its approach which groups the themes in similar groups for comparison as in all the town themes, and all the fight themes together, etc. I rather wanted more the traditional sequential presentation for each game where I could follow the drama through my ears. I could always buy the additional CDs up to the present individually. The music for the purple box set is performed by the London symphonic orchestra and here are some of my musical impressions of it. 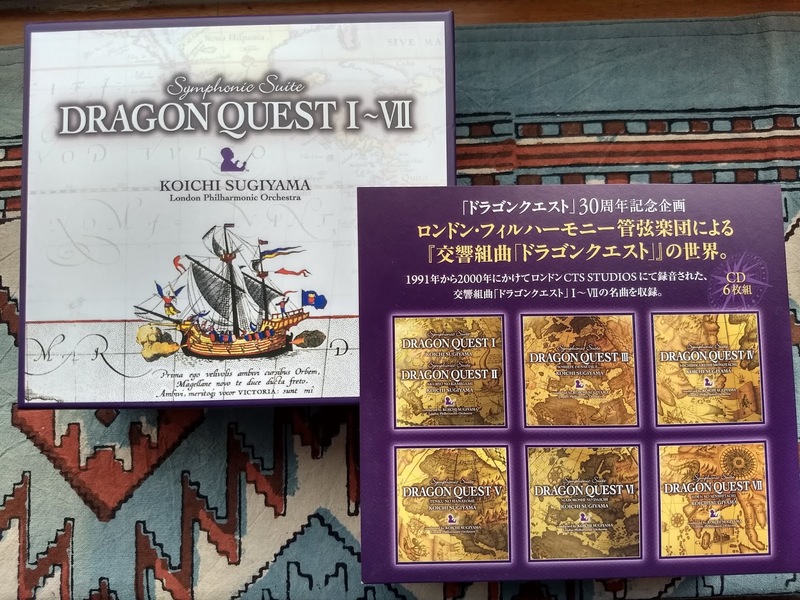 Be, however, informed that I only ever played DQ I & II and had the opportunity of watching the anime series. This means that I was not familiar at all from IV on which shows in what follows. Overture March. The title music is probably the most memorable piece from the whole series, if anything because it is retaken by each game. Here, in its first appearance, consists in the fanfare and march followed by some small variations. Variations are the norm for this first release and in my case they are always welcome because they play on the things you know and love. The fanfare and march is very exciting and sets you in the mood for the things to come. Château Ladutorm. The castle theme is played delicately on strings followed by a small fantasy on its theme. People. The town theme, now that I can hear it orchestrated, feels very pastoral-like. This one now is extended moving from strings to glockspiel to woodwinds. So playful in its entirety that it could function as a theme for a children's show. Unknown World. The overworld theme played by a single flute occasionally supported by heavy strings inspires a sense of loneliness. As you know, there was just a lone hero with no party system. This theme is the least changed from the game rendition. Fight. Now, the battle theme is one of the worst, if not the worst, battle music I have ever heard. The first time I played the game I thought that it was broken. With the benefit of the orchestration is now more listenable and some enjoyment can be drawn out of it. The battle alert is played out and an extension for the theme adds more drama. Dungeons. The loveliest piece is this one, narrowly edging the overworld theme. There is a feel of cool, spooky darkness where you can almost feel the condensation on the dungeon walls. In the NES version, once you got to the castle of the Dragonlord the music became slower and deeper the further in the player explores it. This effect is reproduced here with variations. King Dragon. I'm not especially fond of the gong at the beginning of the final fight with the Dragonlord as it gives an out of place Chinese feel to it; however, the rest of the track more than makes up for it. The growing pressure clearly reminds me of Mars from Holst's The Planets. There is something else that rings a bell… Bolero? Finale. This first victory theme for the series is very solid and in part so touching that it gives me the chills especially the rising crescendo. Dragonquest March. The title fanfare for the second installment has a more brassy feel. Only Lonely Boy. One of the longest in its original NES inception is surprising now in its instrumentation work performed only by plucked strings. I would have liked some other idea, but as it is, it is welcome. Pastoral ~ Catastrophe. I cannot remember having heard this one at all before though, it is still evocative. Château. I believe this one is the most polished track for this title and and the most Baroque in the box set. Sounds like an adagio Bach would write in a calmer season. Sadness. Town. As you would expect, the jolly town theme is yet another jolly town theme. This one has an extension and I like those horns. Fight in the Dungeon~ Devils Tower. This one gives me the sensation of listening something out of the Smurfs were evil is not really evil but fun, safe evil. Impressionistic as well. Requiem. Another effective theme that ties up well with the Château music. Endless World. The overworld themes bouquet starts melancholicly as if recovering from defeat and then setting the eyes high. The oboe solo makes me want to remember something. The lonely theme from the first game sounds now even more lonesome than before and the third overworld with hope and power. In conjunction, these three together are the most cinematic up until now. Beyond the Waves. I don't really care much for the ship themes, but there are really many of them all throughout the games. This one sounds like a waltz for a ball. Deathfight~ Dead or Alive. The final boss fight sounds now way better than it used to. The drums give and take and on the whole, is the most complex for the game. A quick note here: this is the hardest final boss encounter I've ever experienced. In one round the enemy would deal a brutal amount of damage; in the next one, it would cast heal all on himself. My Road My Journey. The final theme is a crowning achievement in emotion. This one is probably in my top two ending themes of all time and it is reused for the anime series. This is what an ending theme should really sound like. I frequently tear up a bit when I listen to it or remember it. Roto. Another good version of the fanfare and march. Unextended. Adventure. Also occurred in the anime series. Dungeon ~ Tower ~ The Phantom Ship. This one contains another solid dungeon theme which was also featured in the anime series. The phantom part reminds me of the music you hear in the lower levels of Castlevania III. Into the Legend. The final theme is on par with the previous two. Overture. This version of introductory theme is different enough to be enjoyed on its own. Comrades. This one is a long succession of great themes, including one in Spanish style, which by itself makes the album. In a town. Some jazz. Of the collection, I feel this is the weakest title. Not bad, but I couldn't find a theme to hang onto. Maybe perhaps the battle music? Things noticeably pick up in this installment, though not quite on par with the first four titles. Through the Fields~ Wandering through the Silence~ Another World. Another nice musical collection of themes which brings the world to life. There is more jazz here as well. The final piece clearly reminds me of the main title and march from A Fistful of Dynamite by Ennio Morricone. It even has corresponding instrumental wah wahs. Flying Bed. Sounds to me as it were composed by Leroy Anderson. Overture VII. The main theme once more. By now it hasn't really changed over the last three installments. Strolling into Town. More jazz this time is Sinatra style. Memories of a Lost World~ Moving through the Present. The first part reminds me of a Final Fantasy IV theme. Fighting Spirit~ World of the Strong. Another good fight theme. Screams from the Tower Monsters. Very effective. I liked it. Orgo Demila. I hear some Rite of Spring in here. In the end this is an excellent collection yet one that is not uniformly so. It would appear to me that that the composer's best ideas were used up on the first four installments and on the later games he coasts on a trodden path. Notwithstanding, he still manages to surprise from time to time and the orchestrations is what any game music aficionado could hope for. Now, the experience doesn't end here. While completing my order I came across and added the string quartet adaptations album. In general I like how strings sound, but I cannot wrap around my head how to enjoy a proper string quartet. I figured that with uncomplicated, beautiful known melodies I could have some traction. I left this album last, after I had been acquainted with the box set and am happy to say that it was not disappointed in the least. This unassuming album indeed is a very special one that not only retakes the themes but manages to incorporate more compositional ideas to them. The music stands on a different level than the already great box set. I believe that each piece, each track represents the best version the composer could dream of. Each one by itself is like a gem for its quality and would be a standout anywhere else. Having them all set in one place is just breathtaking. There is no chaff here and I call it now: this is the best album of the year for me. If you're going to buy only one album I would recommend you to be this one. It can be identified by its white cover and ivy motif. What's next for the future? There's a bewildering amount of releases for the Dragon Quest series judging by the videogame music database page on it. I'm very glad of having struck gold on my first attempt, but I'm not so sure if I would like getting more and more albums as I feel I would be getting negative utility quite soon. In other words, I feel I had already had my fill. I intended to get the symphonic from VIII to the present, each album bought separately. These other albums appear to be well rated by others, but I would need some other push to order them. Had I actually played the games, things would surely be different. Now however, if there's ever another string quartet release, I will pounce on it in a heartbeat. If you're anything like me, you might have wondered where to get the title pop-up book after watching the Babadook. As it turns out there was a limited edition of them and have been sold out for years now. Copies can still be bought at auction sites and such, but for hundreds of dollars. 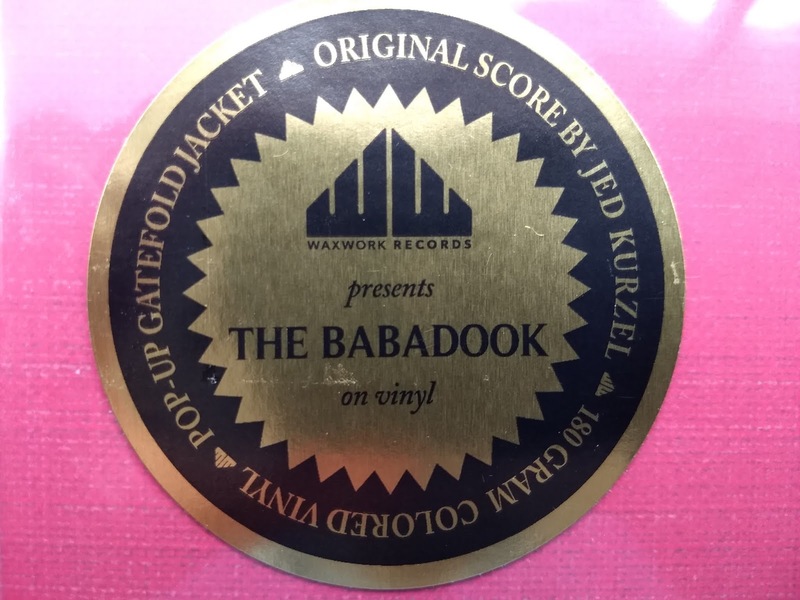 After getting wind that Waxwork Records was going to release the standard for this title last year I decided that it was the best next thing to the actual book. 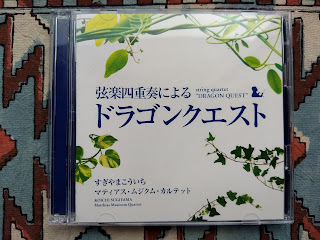 After all this, however, I feel it gets half a point back for the actual music which lives up to the oniric theme and places the whole release on a more balanced footing between music and looks.